Solomon Treasure, with gallery showrooms in New York City and Beverly Hills (and agents in Tokyo and London), has been collecting and offering exquisite 19th century furniture and decorative arts for four generations. The firm sells its merchandise at a fixed price, and has a presence on Barnebys.com, where collectors of fine items normally accustomed to buying at auction can purchase immediately, without bidding. Solomon Treasure features quality antiques mostly from Europe, but also the Middle East, Russia and Asia. 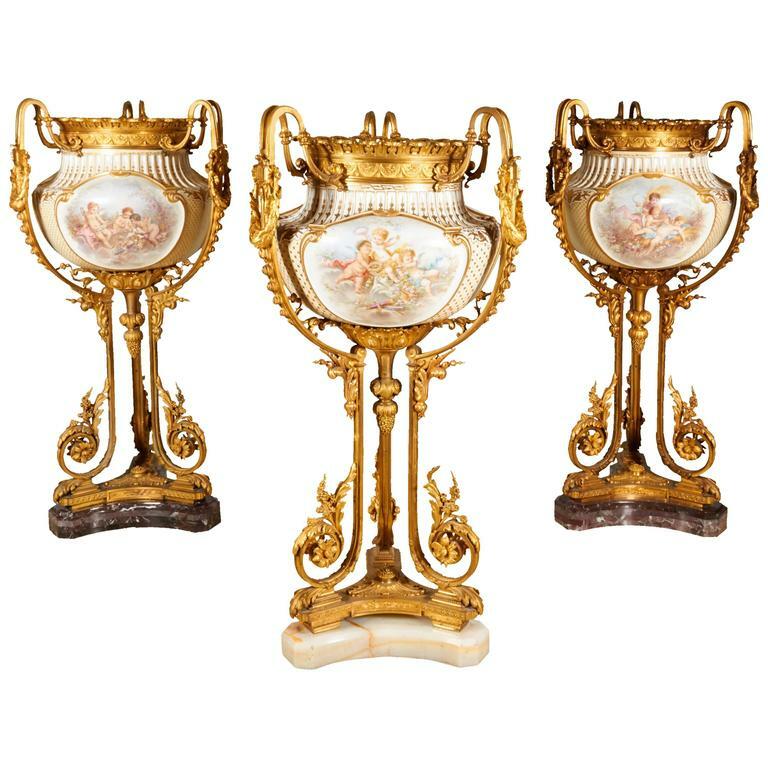 An example of the quality visitors to the Solomon Treasure catalog will find is the highly important and monumental three-piece Sevres-style porcelain garniture pictured here. The set, mounted in the finest ormolu, was originally commissioned for a royal family in Paris. It is twice signed by Eugene Poitevin, who is recorded as a painter in pâte tendre (soft paste) in the style of Sieffert and Malpass, both formerly of the Sevres manufactory. Each body is molded with three large cartouches, all finely painted. The selling price: $800,000. 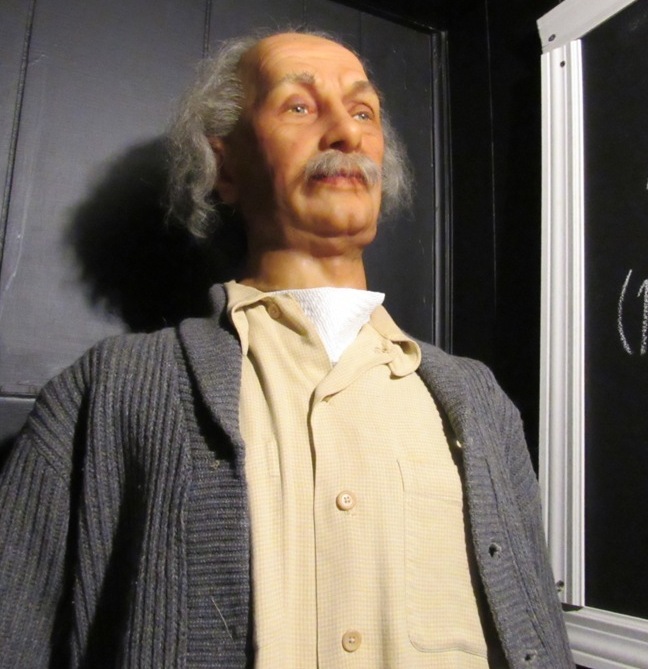 An exceptional collection of about 60 life-size wax figures, including a one-of-a-kind figure of Albert Einstein that was signed and inscribed by Einstein himself, will headline an auction planned for Saturday, May 13th, by Pa. OnSite Auction Company, at the Eisenhower Hotel & Conference Center in Gettysburg, Pa. starting promptly at 9 am Central time. It is a live-only auction, with no internet bidding, with the exception of around 25 lots that will be available for sale online. Absentee and phone bids will be accepted. The Einstein wax figure was created in 1947 by Katherine Stubergh, who’s often called “the Madame Tussaud of America.” It was commissioned by Einstein, who was friends with Ms. Stubergh and it is signed and inscribed the nape of the neck, “Katherine, Much Thanks, Albert Einstein.” Most of the figures in the collection were made by Ms. Stubergh and encompass many genres. The collection is owned by Preston Evans, himself a former auctioneer and owner of Preston Evans Opportunities, based in Newnan, Georgia. Anyone who doubts that old petroliana and automobilia signs carry significant value need look no further than the list of expected top lots in Morphy’s upcoming auction planned for April 22nd and 23rd, online and at the firm’s gallery in Denver, Pa. Topping the list is the sign pictured here: a Musgo Gasoline Michigan’s Mile Maker sign nicely decorated with the profile of a proud Indian chief. 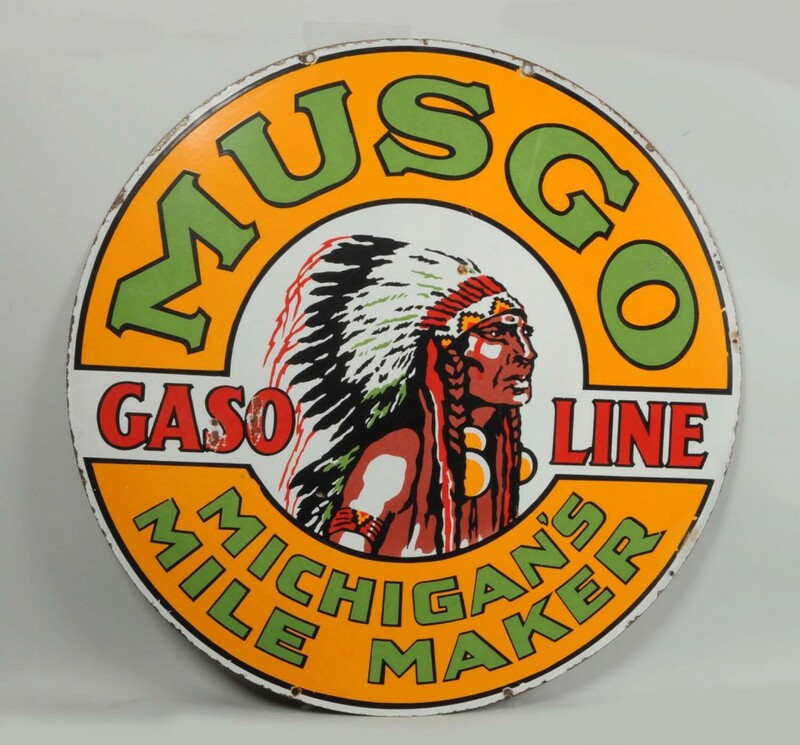 Considered the “holy grail” of porcelain gasoline advertising, this fine example of septic tank Musgo signs is estimated to bring $80,000-$120,000. Several other lots carry estimates of $50,000-$80,000 – not too shabby either. These include an unusual double-sided porcelain Harbor Petroleum Products sign featuring a great graphic of Howard Hughes’s Spruce Goose airplane flying out of Los Angeles Harbor; a nearly flawless single-sided porcelain Kelly Tires “Lotta Miles” graphic sign in excellent condition with perfect color and gloss; and a single-sided porcelain Beacon Ethyl Gasoline lighthouse sign, a fantastic example with outstanding color and gloss throughout. Anyone who remembers learning about the Spanish conquerors during history lessons in grade school will recognize the name Hernan Cortes (1485-1547), the Spanish conquistador who led an expedition that caused the fall of the Aztec Empire and brought large portions of mainland Mexico under Spanish rule in the early 16th century. 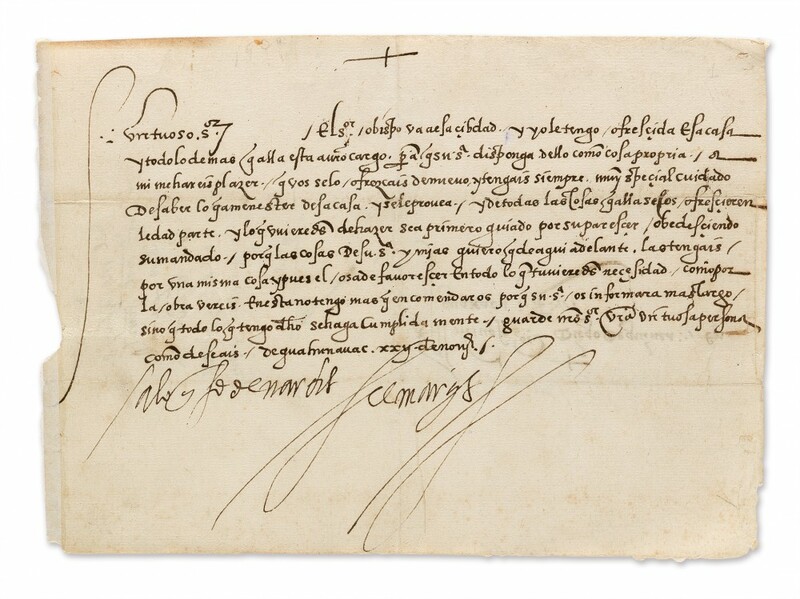 Exactly one letter written by Cortes has appeared at auction since 1984. A second will be offered on Thursday, April 27th, at Swann Auction Galleries’ Printed & Manuscript Americana Auction. In the 1538 letter, Cortes writes to the Majordomo Diego de Guinea, instructing him to provide hospitality to a visiting bishop. It has a pre-sale estimate of $50,000-$75,000.The auction will also feature outstanding material related to early New York history, including the 1848-1849 diary of Edith H. Brevoort, a wealthy Manhattanite who describes visiting “the wilderness of Northern Manhattan” (currently around 70th Street); and an unrecorded election circular for the New York Constitutional Convention, dated June 15, 1776. John Moran Auctioneers in Monrovia, California is funneling its higher-value (or more collector-specific) auction items into more focused, genre-specific decorative art auctions. The April 25th auction will be the first of these specialized auction dates, comprising three stand-alone sessions. The first session – 20th Century and Contemporary Design – will kick off at 4 pm Pacific time and feature modern and contemporary works of fine art alongside furniture, art glass, sculpture and pottery by a wide range of artists. 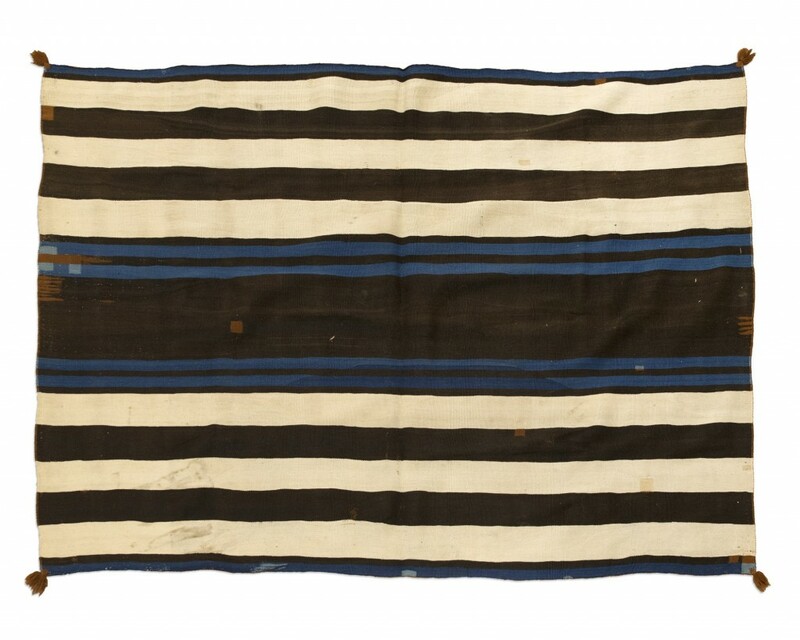 The second session, starting at 6:30 pm, is titled Art of the American West and will feature rare Navajo weavings, Plains Indian beadwork and bronzes by prominent contemporary Western artists. Then, at 7:30 pm, the third session – titled The Traditional Collector – will cater to collectors of French furniture, art glass, silver and objets de vertu (small, finely made items displaying particular beauty or rarity). The new strategy follows extensive building renovations and the adoption of preview and auction-day amenities.